Settled in the village of Buntis Bongkor is this lovely piece of natural wonder called Bukit Moko or as people call it Puncak Bintang Bukit Moko Bandung. The place is for nature lovers who wish to spend some time amidst nature. The place is very much frequented by both folks and tourists alike who come here to witness its flowers and greenery. The place offers quietude for peace seeking individuals and does wonders for couples. 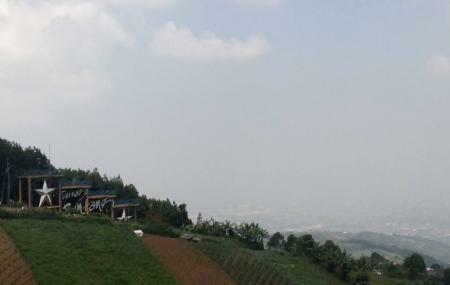 The place is located 1500 m above sea level on the hill of Bandung Cimenyan area. Come to feel rejuvenated and enjoy the best that Bali has to give! Find the joy in planning a D.I.Y. trip by using this awesome Bandung trip planner. Find out how to reach Bandung to begin with. Plenty of wholesome Bandung vacation packages are available to choose from, pick your today! Parking and toilets are available. Wear sturdy boots for the climb and drape warm clothing. Roads are not good hence used good vehicles to reach the place. How popular is Bukit Moko? People normally club together Saung Angklung Udjo and Jalan Braga while planning their visit to Bukit Moko. People also prefer to end their day with Bukit Moko. This place is at the top of the hill overlooking Bandung city. The forest here is planted with lots of pine tree. Weather is cool in this area. Parking lot is limited at the park. Road up the hill is very narrow and steep. There are camping ground available for overnight stay. and night view from the peak is very beautiful. I love the walk around the pine forest. all the pine needles on the ground is relaxing to see. I went here on new years eve. I thought it was some kind of a resort, turned out it was more like a cheap camping ground. It offers a great view of Bandung from uphill, though. I didn't go to the camping ground, instead I just ate dinner at a local restaurant nearby. It was really cheap, but the food is not really that good. But, you really can enjoy the view. You can get here by car or motorcycle. If you're planning to get here by car, make sure your driving skill is good enough and better use a manual gear car. The way there is very steep and it is a one way road, so it is kinda tricky when you meet other vehicle on the road.